Not a good start at #1 where the obvious attack point, the fence, was marked too far south. I never crossed the fence, I went round it on the southern side, both in and out. #2 I will blame the brown snake that launched itself off the rock face at high speed 5m to my left. Having passed Simon leaving the area (as I thought), I assumed I was no where near the control, as the snake would have been scared off, and went hunting elsewhere. In fact, Simon had not found the control, the snake had practically leapt over the top of it, and I wasted many minutes before relocating and coming back to the same spot, well after Simon had been and gone. I joined in with Geoff, Ted, and Aislin into #3 and #4, so no mistakes there, but lost touch, with them AND my map, when I stopped to retie a shoe lace (I will blame the thick scrub for that), used the wrong knoll as an attack point for #5, punched, and went back to the track wondering why I had caught Simon and why he left the control in a totally different direction, before realizing it was actually #6 I had punched, not #5. #7 was easy (at last), but #8 required a great deal of precision. Unfortunately not precise enough, and more time lost. I used #3 as an attack point for #9. Phew. Then it start to drizzle, with thunder, and the next few were done with only short glances at the map, to hide it from the raindrops. This seemed to improve my navigation enormously! I abandoned the last few that looped away from the finish, fearing the map would turn to mush, and I would not know where to find the finish in the rain. 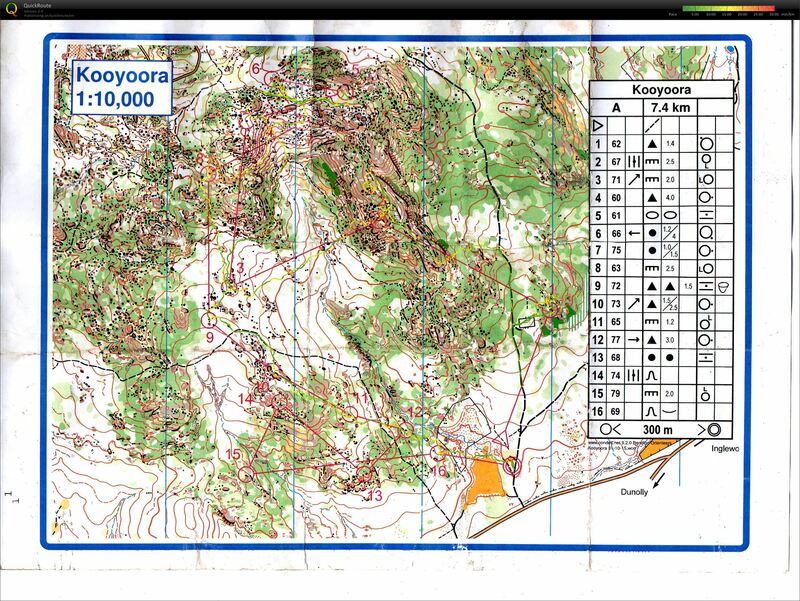 Kooyoora is always challenging, but this the only time I have failed to complete a course there.